Hi all! PinkyParadise is now running the fourth round of the Friendship Giveaway now on blogger! 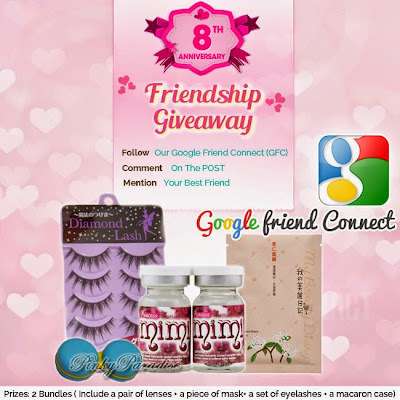 All you have to do is just follow our Google Friend Connect(GFC) , comment on this post and mention your friend. By doing so, you are now in the running to win a free bundle set with your friend! No need to make purchase, all you have to do is follow our GFC and comment ! *Contest will run until 24th September 2014 (World Time).